Astrophysicists, when speaking of creation, tell us that in the beginning all matter in the universe would have been present in that ‘primeval atom,’ super condensed to an unbelievable degree. In such a state, matter would no longer be possible as matter. It would be stripped down to pure undifferentiated raw energy. Variations like gravity and light would not emerged and Time and Space would not yet be real. The sages would find this a prefect metaphor for the unitive state. In samadhi, reality is condensed into pure potential, without dimensions or differentiation. Physicists do not say there was nothing before the Big Bang; they say everything came from that, and nothing more can be said. Similarly, samadhi is not emptiness but complete fullness. That fullness the Upanishads call sat: absolute reality, in which all creation is implicit as on organism is implicit in its DNA or a tree in its seed. The joy of being in this state cannot be described. It is infinite. This is the second message of the Upanishads. The infinite, unbounded, full of joy – is our native state. This is Sat-Chit- Ananda. Pure unconditioned awareness which is Absolute Bliss. How can one attempt to explain such a state, the true nature of one’s Self? 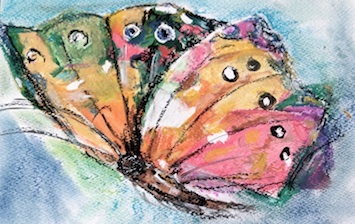 “Words turn back frightened,” the Upanishads say. Yet, the sages must have longed so ardently to communicate that they had to try even if the picture was doomed to be incomplete. For this Self transcends all ! Most significantly the Upanishads tell us that our. native state is a realm where death cannot reach. They knew first-hand that when the Self withdraws consciousness from the body, the continuity of personality is not broken. Death would not be different. gathers in its faculties and reaches out from the old body to new. Finally, if both body and mind are made of prana which dissolves on death and if personality returns life after life than surely heaven too must be a state of consciousness, part of the created world. It might be more blissful than the physical world but it too had to be transitory. The goal then is Self- realisation of one’s true nature: not matter embodied or disembodied, but the uncreated Self. Thus Self -realisation is immortality in an entirely new sense: not ‘everlasting life’ but beyond death and life alike. It must be understood here that Upanishads present no system. When much later India’s mystics and philosophers built structures based on these foundations they found they had produced points of logical disagreement. But they all understood that in practice all systems come to same thing. From one point of view the world is God, from another there will always be a veil of difference between the embodied person and the Godhead. Both are true, and neither is the whole truth. Reality is beyond all limitations. In the end then, the Upanishads belong not just to Hinduism. They are India’s most precious legacy to humanity. Although Hinduism famously has no founder and is believed to have grown organically from a collective consciousness and a way of life, all Hindu beliefs and practices find their source in the Vedas. Even today Vedas are widely accepted as the final authority on Hinduism and have greatly influenced Jainism, Sikhism and Buddhism. The word ‘Veda’ comes from the root ‘vid’,to know. Veda means knowledge. There are two kinds of knowledge. Shruti, that which is heard or revealed and Smriti, that which is remembered. The Vedas are Shruti and other scriptures like the Puranas and the epics Mahabharata and Ramayana are Smriti. Hindus believe the Vedas are eternal truths revealed to great rishis of ancient times.The word ‘rishi’ means a ‘seer’ and comes from the root, dris which means to see. A rishi is a seer of mantra or thought. The thought already exists as eternal Truth. A rishi only discovers it spiritually. In that sense the Vedas are eternal. The books may be destroyed but the knowledge cannot be destroyed. As for the actual written texts, scholars believe that they were written down some 2,500 years ago, though the tradition often dates them to the beginning of Kali-yuga (circa 3000 BCE). The following is an overview of the four Vedas. 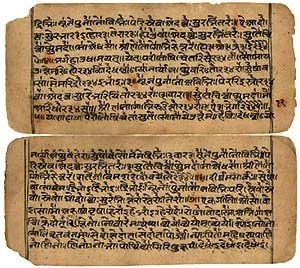 The most important and oldest of the Vedas. It is divided into ten books (called mandalas) and has 1028 hymns in praise of various deities. These include Indra, Agni, Vishnu, Rudra, Varuna, and other early or “Vedic gods.” It also contains the famous Gayatri mantra and the prayer called the Purusha Shukta (the story of Primal Man). This veda is purely a collection of melodies,‘saman’ to be sung during worship. The hymns in the Sama Veda, used as musical notes, were almost completely drawn from the Rig Veda and have no distinctive lesson of their own. Hence it is considered as a reduced version of the Rig Veda. Contains hymns, mantras and incantations. Within each of the four books there are four types of composition, or divisions, as shown below. The Samhitas – literally “collections,” in this case of hymns and mantras. They form the Veda proper. The Brahmanas – prose manuals of ritual and prayer for the guiding priests. They tend to explain the Samhitas. They also contain early versions of some stories. The Aranyakas – literally “forest books” for hermits and saints. They are philosophical treatises. The Upanishads – books of philosophy, also called “Vedanta,” the end or conclusion of the Vedas. There are also two important bodies of supplementary literature, related closely to the Vedas, Vedangas and Upvedas. 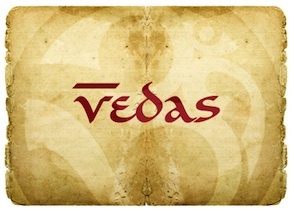 The Vedangas (limbs of the Vedas), expound the sciences required to understand and apply the Vedas. The Upavedas (usually considered smriti) deal with the four traditional arts and sciences. In the next post we’ll look at the Upanishads, the sublime essence of the Vedas.